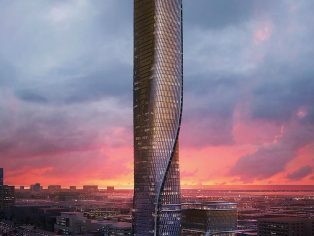 The project is located in an exceptional central position in Dubai’s network – along Sheikh Zayed Road, the main thoroughfare that connects the Emirates north to south – and directly opposite the Burj Khalifa. 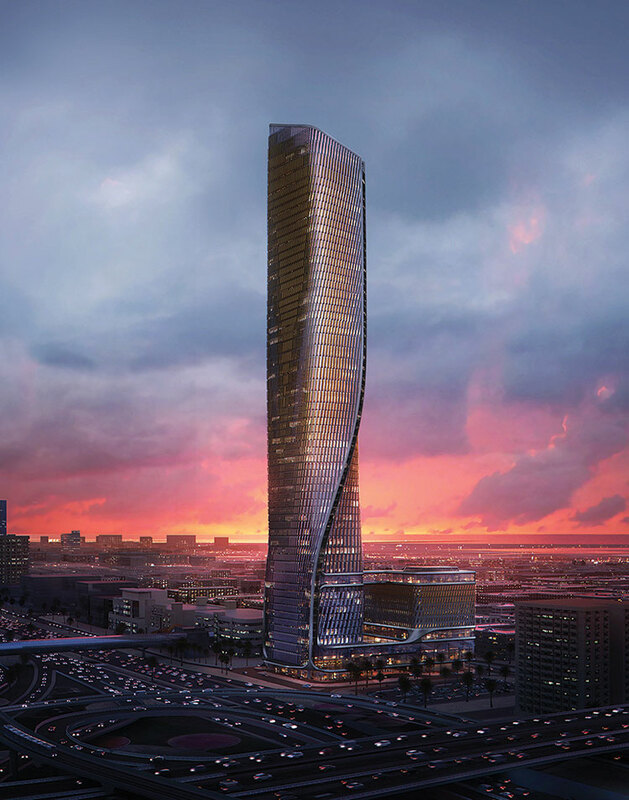 When completed the Wasl Tower will be one of the world’s tallest ceramic facades. Dubai’s reputation as a transfer hub is rapidly transforming into one of a long stay destination, especially during the cooler winter months. The city also enjoys an impressive infrastructure. When arriving at night by plane or car it resembles an ever evolving organism in the dark dessert; connecting places, people and culture. 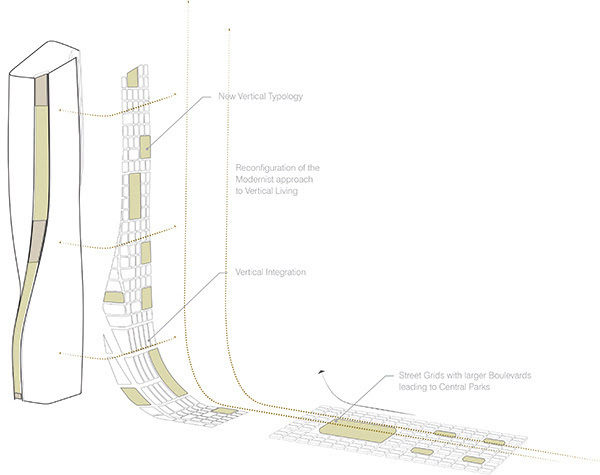 The design concept for Wasl Tower – a slender 300 metre tall super-high-rise – reflects the notion of these connections. 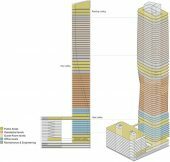 Adopting a classic ‘contrapposto’ movement, the mixed-use tower faces in almost every direction and offers public areas high up in the building. 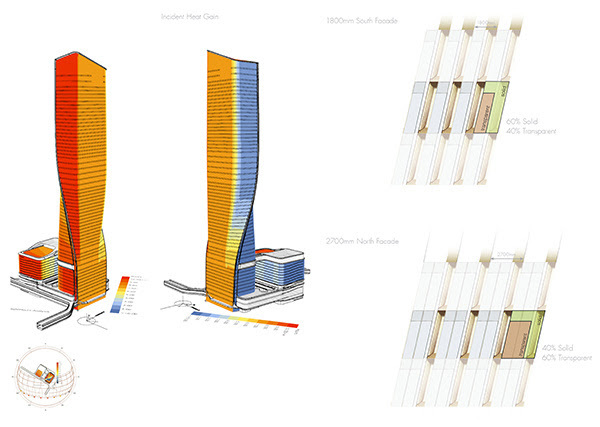 UNStudio’s design is closely interlinked with the engineering and sustainability concept developed by Werner Sobek. This close cooperation defines scale, light, building physics and materialisation. In addition, smart access, communication and security provide a seamless technological base which is integrated with the architecture. Clean materials, interactive light levels, in addition to good acoustics are implemented in all spaces throughout the building. Particularly on the public levels, when combined with a specific food experience, hosting and aesthetics, they will result in a seductive activation of the human senses. 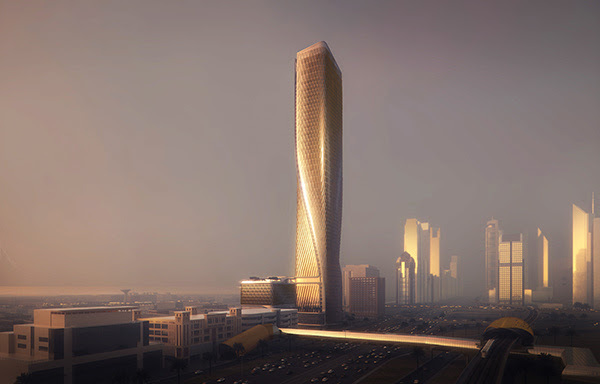 Wasl Tower will be one of the world’s tallest ceramic facades. 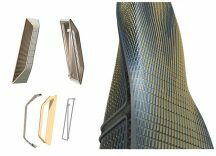 In consultation with the client, clay was chosen as a basic material, as such the facade fins will be manufactured as low-tech, glazed ceramic elements. The geometry of the tower achieved its holistic appearance by means of innovative parametric design and high-tech engineering. The available sustainable measures required in the broader region have been seamlessly implemented into the design. On the facade a fine lace of inclined fins over the basic skin literally veils the geometry and provides the required ‘closed’ surfaces. 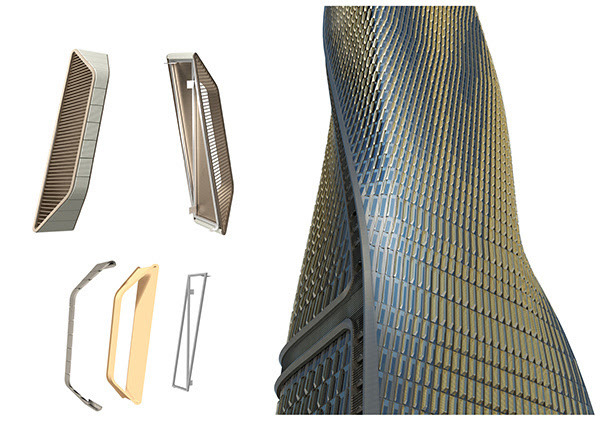 These fins not only provide shade, but also reflect daylight deep into the tower’s interior. The open seam that runs the full height of the tower forms a ‘vertical boulevard’, which is topped by infinity pools on the tower roof. This seam is created by a stacking of outdoor balconies and forms a green vein which also affords a glimpse of the interior of the building. The boulevard connects the outdoor with the indoor and is a unique feature for the region. Facade lighting housed behind the fins and developed with Arup Lighting, is programmed as a rhythmic animation that breathes with the cadence of this 24-hour metropole and provides a visual connection to the city. This facade lighting is powered the energy cube pv panels located on the car park building. 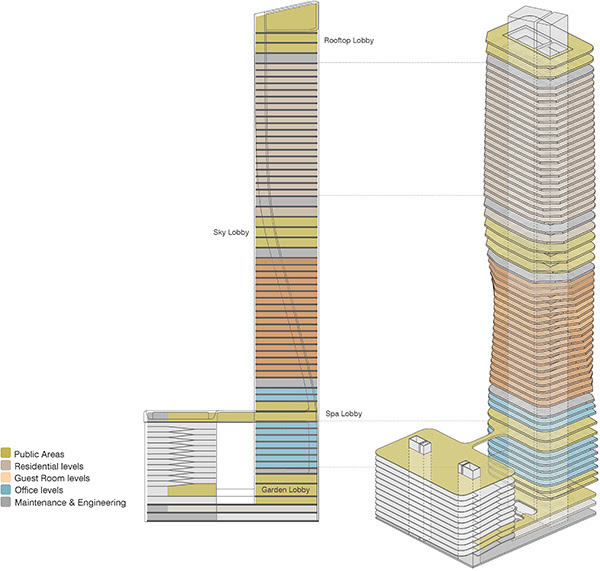 The inside of the tower is equally sustainable. The mixed-use programme, comprising offices, guest rooms, public areas and apartments, presented a challenging core configuration. A smart structural concept – with three 300 metre high shear walls in the core that connect 4 large outriggers on strategic levels – gives the tower an almost free, highly efficient floorplate. Meanwhile a vertical transport strategy is implemented to facilitate separate access to the various programmes. Three high-speed express lifts connect the four main lobbies (ground / spa /sky and rooftop) which contain most of the public programme and the main access for the hotel (at 150 metres). 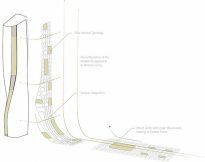 Four office and four guestroom lifts share the same lift shaft, while the residential apartments on the higher levels have their own designated lift-group, making direct access via the basement parking possible. In total the building provides 17 lifts, of which 5 are service elevators. The tower is supported by a low rise car-park building which, uniquely, also houses a large, column-free ballroom on the first floor. Programming this element in this location provided the advantage that the ground floor lobby now spans the full premises and creates a ‘walled’ garden, providing shade and cooling, even during the Summer months. The roof of the car park building is a large outdoor pool deck and is connected to the spa lobby in the tower via a pedestrian bridge, which provides access for all guests and visitors. 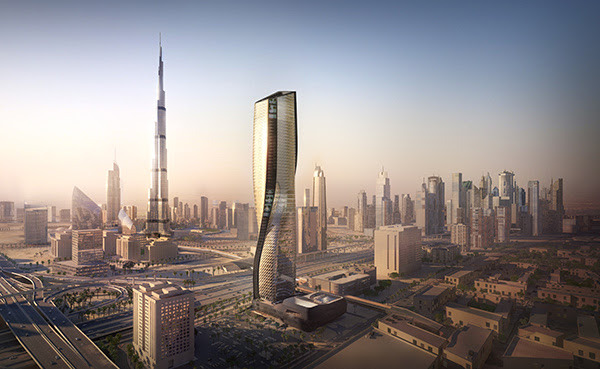 Mandarin Oriental, one of the world’s top hospitality brands, will operate the full building and will establish its MO@Dubai hotel here, with 250+ luxury 5* guest rooms. Construction started in 2016. 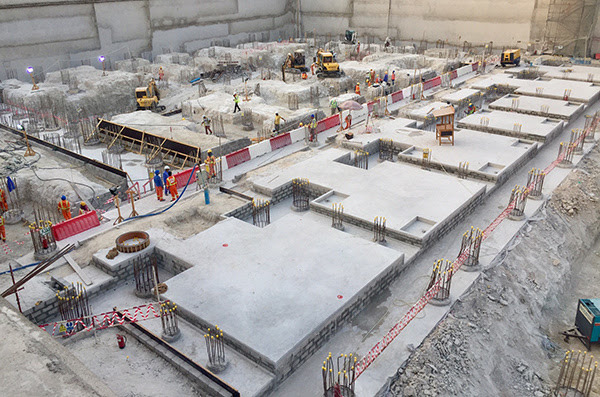 The general contractor Arabtec was appointed to start main works in 2017. 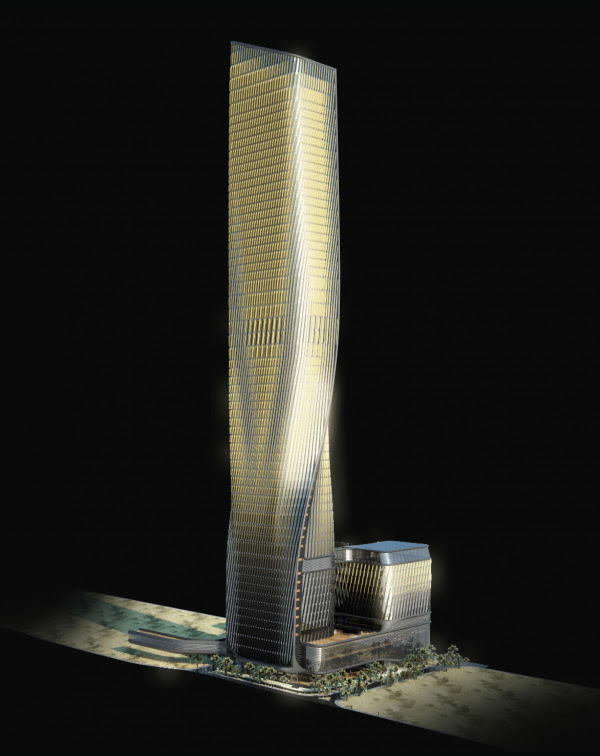 In 2020 MO@Dubai and the Wasl Tower will be open to guests and visitors alike.